For most of us, designing simple user interfaces, simple user interactions, and simple user experiences are things we strive for when making new products. We recognize that this simplicity makes our product desirable to the user and why a product gets labeled as “good”. What we rarely talk about though, is how hard simple is. This quote, like many well-known quotes, often gets attributed to the wrong people, like Abraham Lincoln or Winston Churchill. What Pascal meant was what he had just written was from the top of his mind and he couldn’t spend enough time processing his ideas and thoughts into a well-crafted piece. Creating something simple and short without loosing the essence of your idea is hard – regardless if it’s a letter to a friend or an iPhone app. Personally, it might not seem like an exciting experience to visualize energy consumption with E.ON, but I am constantly challenged by this task. Making the overly complex seem simple. There’s an art to it. It doesn’t matter who the client is, it’s always been my guiding principle to ask the question, “how can I simplify this task?” Maybe I’m secretly aware of the fact that there are others that are far better at designing beautiful interfaces than me, but long before I’d been called a UX-Designer I was more interested in simplifying and improving tasks rather than making the perfect gradient for a button. If you put in the time to make complex tasks simple, your users will thank you. Just think of the processes that Amazon goes through. Every time you return to purchase something, your address, credit card information, and shipping preferences are all ready to go with one, simple push of a button. When Amazon introduced one-click shopping, the company’s revenues skyrocketed. The same goes for the successes that Apple has seen throughout the last 10-15 years. I’m sure you’ve also seen a toddler pickup an iPad and start “using” it! It’s interfaces are simple and intuitive and the hardware has a straight forward design. Recently they received massive public criticism for the removal of the headphone jack. In the same stroke, they introduced AirPods that connect seamlessly to your device – unlike any other Bluetooth pairing you’ve ever experienced. Needless to say, there’s been thousands of design and engineering hours put into that “simple” feature. How can this be applied to me? Take a minute to think of the internal processes and systems in your business. In fact, larger corporations many of the internal processes are unnecessarily complex and end up wasting time. “It’s just an internal system” isn’t a valid excuse because your employees will be less motivated to spend more time than needed doing dreadful tasks. Now, let’s consider the processes you put your customers through. Are they just as tedious resulting in customer confusion and, worst of all, a decrease in conversions? Slack, a communication app company, took the standard “forgot your password” option and simplified the entire process easing their user’s experience. Their “send a magic link” option sends you an encrypted link allowing them to login directly. No messy forms, no multi-step processes. Small features like that delight your users. Sure, it wasn’t easy to create, but it makes using the product so much easier. It’s worth it to think critically about simplicity and how to apply it to what you do. Who knows, your competitors may already be offering an easier-to-use alternative. You may lose a customer if they have to reenter all their information at every purchase vs clicking just one button. You may lose a customer if they have to read a user manual to use your product instead of it just working right out of the box. 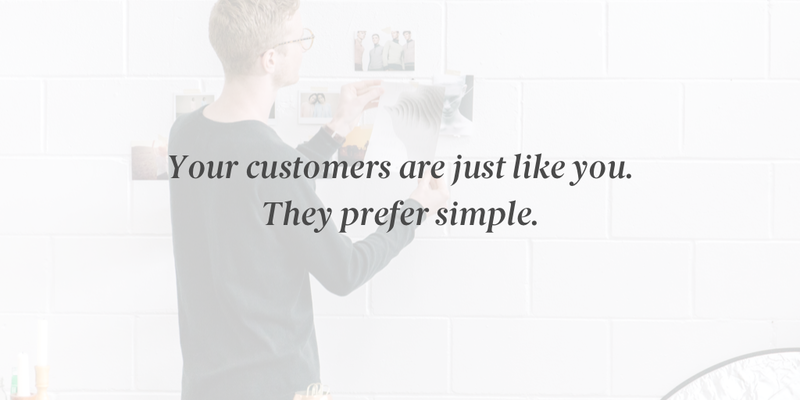 Your customers are just like you. They prefer simple.